Today’s post comes from Josh Owen, industrial designer and associate professor at The Rochester Institute of Technology. I was delighted to have been invited to participate in GlassLab this summer. Almost exactly one year ago, I visited The Corning Museum of Glass for the first time since my childhood. During this recent visit I was fascinated by the array of historical and contemporary archives that are so beautifully communicated on site. And I was immediately moved by the hot glass activities which are integrated into the life of the Museum. Having recently joined the faculty of design at the Rochester Institute of Technology, a short drive north of Corning, I was also intrigued by this new and exciting neighbor. A partnership between Corning and RIT seemed almost inevitable given RIT’s proximity, powerful teaching of design history, practice and technology, and CMoG’s vision for exploring design innovation with their unparalleled knowledge of the glass medium. So once I had met with the management at CMoG the Metaproject 02 became an exercise of shared goals. To make a very long story short, I spent 2010/11 learning and working through design and glass issues with a team of incredibly knowledgeable professors of glass, students of glass and of industrial design and the players at CMoG to push the envelope of possibilities for glass. When CMoG asked me to take off my professorial cap and put on my designer’s cap for GlassLab I felt as if I had a year of boot camp already under my belt. After two days of work sessions together with master craftsmen at The Corning Museum of Glass as a part of the GlassLab project, Tina Oldknow, curator of modern glass, chose to accession three items from the sessions into the Museum’s GlassLab prototype collection. 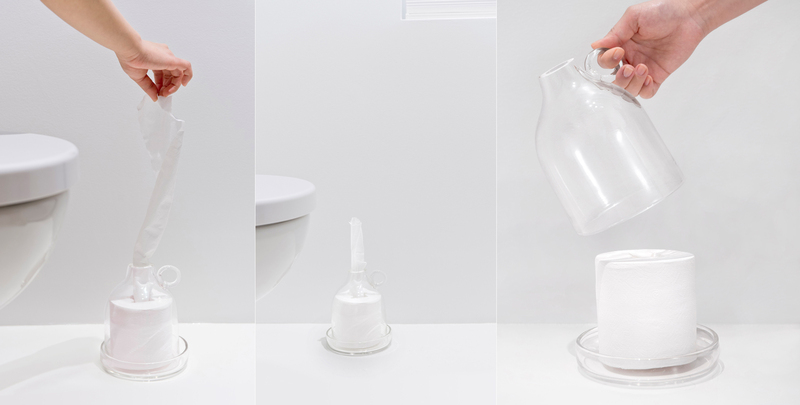 The items consist of three functional vessels that address specific domestic conditions in the bed and bath. 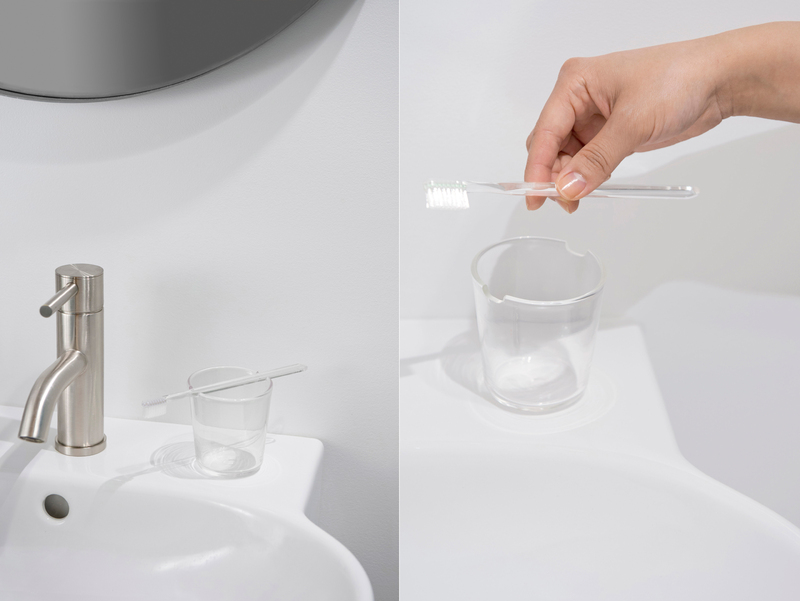 The first item accommodates a more sustainable approach to distributing toilet paper, the second is a shallow bowl which manages bedside technology use and the third merges toothbrush holder with a drinking cup to create efficiencies in often cramped spaces. makes use of a major advance in toilet paper where the rolls become tube-free. This modification is the first important change in the state of this product in nearly 100 years and considering that some 17 billion toilet paper tubes are produced annually in the USA, the implications are quite dramatic. I made the observation that with these new rolls, the toilet paper can be retrieved from the inside outward by pulling from the top rather than the way in which traditional TP tubes are used in the spindle arrangement, pulling off sheets from the side. 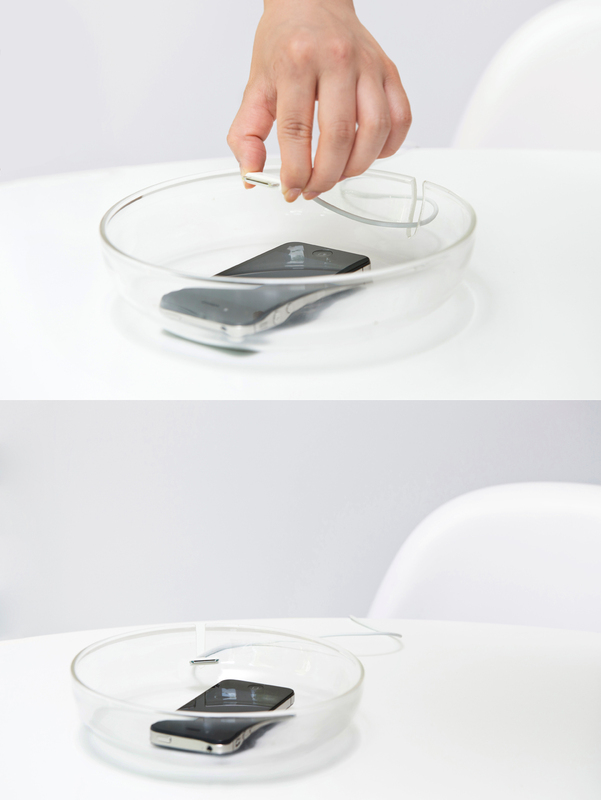 The prototype I designed is simply a container for this new behavior which allows the item to sit on the floor, protected by the cup and saucer-like arrangement from any moisture. The ring detail near the top enables the user to easily lift the cover off to add a new roll. considers the problem of the charging cable. All cell phones have one of these to contend with and a problem that we all face is fishing the fallen cord from the floor or from behind a bookcase etc. This design allows the power-cord to stay located in the bowl which can easily accommodate any sort of phone which – in today’s world – is often kept at the bedside and used not just for communication but as an alarm clock etc. This design also promotes a culture of charging while sleeping which eliminates the problem of losing a charge during waking hours. recognizes the fact that in many bathrooms, usable space around the sink is at a premium. Also, allowing the toothbrush bristles to dry is a constant chore seeking a good, hygienic solution. By employing a notch which is scaled to accept most simple toothbrushes, one can position the bristles over the sink to drip dry and keep two useful tools in one location. I chose to prototype all three of these ideas in clear glass so that they offered an almost invisible, functional aid in performing their tasks. The transparency has no aesthetic purpose for me — it simply creates the most deliberate way of testing the functionality of the ideas. This leaves these products with nothing but their function to prove and allows them to act as perfect prototypes with all aspects visible. The immediacy of the hot glass medium allows for remarkable live modification to design models. The notion of ‘rapid prototyping’ may be more pronounced in this approach than any other existing technology which is ironic given the significantly mature age of the technology involved. The bottom line with the plasticity of the hot glass is that when you have talented craftspersons executing your ideas, they have the ability to turn on a dime to modify plans as they materialize. As a designer, one has the great benefit of seeing a vision take form before one’s eyes. The inevitabilities of human-scaled relationships in products change when we see objects directly in front of us. As one who obsesses over what many would consider tiny details and nuances, I found myself modifying scale, edge-conditions and radius treatments as I watched the glass take shape. Any good design is a harmonious execution of the idea and what the material does well naturally. I have not experienced a more immediate proof of this concept in any other medium. As I have said to my friends at the Corning Museum – I’m a convert. He makes an awesome design on glass. People never think this type of design. This kis called as a mind of a good designer.